Really amazed with the speed on Tata Docomo's 3G network! MP3 file of 5 MB in 13 secs. Video file of 35 MB in 1 min. Movie of 800 MB in 33 min. You can easily connect your mobile to your computer (using a USB cable / Bluetooth / creating a Wi-Fi hot spot ) to experience this super fast internet on your computer as well. Tata Docomo offers a variety of 3G plans for both prepay and post pay customers. 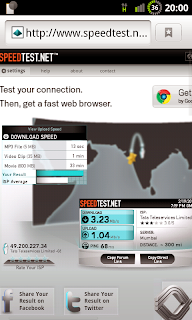 You can check out Tata Docomo's 3G plans here.